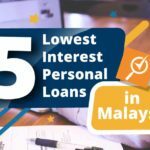 UniFi, an Internet services provider owned by the telecommunications giant Telekom Malaysia (TM), is no stranger to Malaysians. Its speed and reliability far exceeds its predecessor, Streamyx as it is the first Internet provider in Malaysia that utilises fibre optic broadband infrastructure (a.k.a. High Speed Broadband Access or HSBA), which allows for high speed Internet and expansive network coverage across the country. Yes, we all love freebies, and UniFi doesn’t disappoint on this particular account. 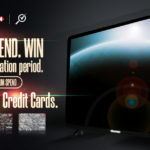 Subscribers are given free equipment including a Broadband Termination Unit (Modem), a Wi-Fi Residential Gateway (Router), a wireless DECT phone (Motorola) and a HyppTV Set-Top box. With an additional RM20 per month, you get 600 minutes of free calls at the rate of RM0.20/minute for both fixed line and mobile numbers. Once you’ve used up your free minutes, your calls will be charged at RM0.10/minute to other fixed lines and mobile numbers. The good news is that all the calls to TM’s fixed lines are free. Sure, when comparing the price of the call charges, Maxis Home Fibre Broadband wins by a large margin with its call rates offered at RM0.05/minute for local calls and RM0.09/minute for both nationwide and mobile number calls. But still, you get to enjoy unlimited free calls to TM numbers with UniFi, which is quite a big savings considering the majority of the Malaysian population owns a TM fixed line. Let’s not forget that you also get free 500MB/day for TM Wi-Fi, meaning free Wi-Fi (of up to 500MB/day) at any TM Hotspots, wherever you go. 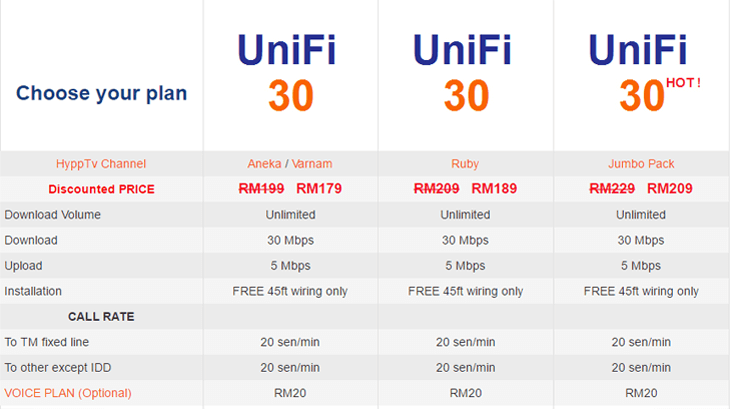 We just love the word ‘free’ when it comes to UniFi. Like its two other main competitors, UniFi offers free activation and installation, although take note that it’s only free for up to 45 feet of wiring. Beyond that, you’ll be charged a fee of RM200 for additional wiring and installation services. There have been complaints from subscribers that UniFi has been charging the additional wiring fee indiscriminately though, especially on forums like Lowyat.net. Some subscribers even brought up the issue to Unifi’s customer service hotline but the outlook wasn’t very promising. In this regard, we advise you to do your own measurements of your house before the installation takes place and be very sure to monitor its progress to avoid paying extra fees. All UniFi plan subscribers enjoy various channels on HyppTV by default, although the channels vary according to your selected plan. You can choose to have either HyppTV Aneka, Varnam or Ruby Packs at different rates. 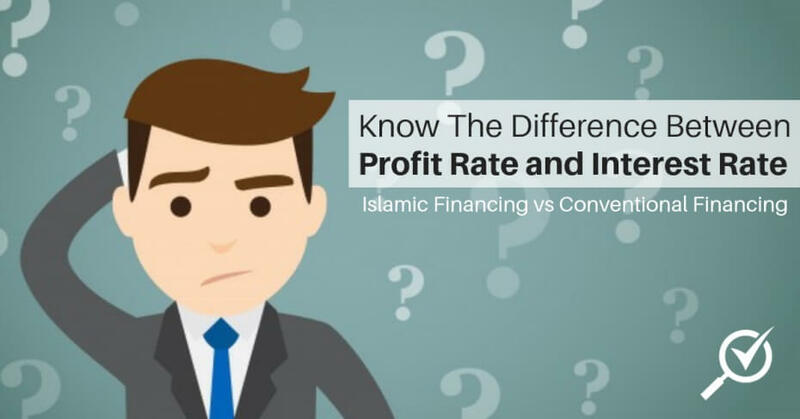 To be honest, the difference between each channel package is only about 9 – 12 extra channels, so if you already have Astro B.Yond or a Netflix or iflix subscription, we’d suggest you to just go with the cheapest package and save the extra Ringgit. 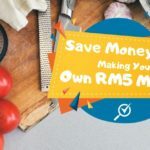 The fees and charges are quite reasonable, and the fact that UniFi offers free installation (for up to 45 feet of wiring), equipment that are worth RM800 and no down payment make it very appealing to most users. Take note that if you downgrade your Internet plan, there is a penalty fee of RM200. 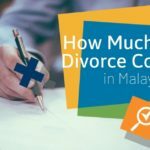 Other than that, other fees are fairly standard – the early termination of the 24 months contract is RM500, much like Maxis. We can’t say the same for its relocation fee, though, as UniFi charges RM300 as relocation fee while Maxis only charges RM200. 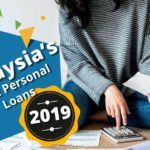 There is a deposit charge for the non-Malaysians users of RM1,000 though, we think that’s a wee bit too high as Maxis only charges RM500 for the non-Malaysian subscribers as a deposit. 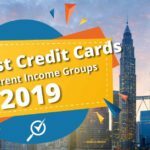 UniFi might want to lower the deposit charge for the non-Malaysians to encourage more expatriates to sign up with it. TM UniFi has launched a new website that serves as an online registration portal for fuss-free registration and subscription, which can be found here. The website also advertises that you get a one month free subscription if you register online. These two plans were launched just late last year, and the old plans (VIP 5Mbps, 10Mbps and 20Mbps) were promptly discontinued, much to the consternation of UniFi’s many users. The cheapest of the UniFi Advance 30Mbps is priced at RM189.74 (including GST) which comes with basic HyppTV channels (a choice between Aneka and Varnam pack). You can choose to have more channels by opting the HyppTV Ruby or Jumbo pack at RM200.34 and RM221.54 respectively (including GST). Again, you can just stick to the basic package if you already have an Astro B.Yond or Netflix/iflix subscription as HyppTV channels and shows can be painfully limited, although it’s great to have if you don’t have any other TV subscription. Speed-wise, although UniFi Advance 30Mbps has a download speed of 30Mbps, the upload speed is only limited to 5Mbps. It’s painfully limited if you’re an avid file uploader/sharer, but it shouldn’t bother you too much if you’re a moderate user who mainly use the internet for browsing and downloading. If the upload speeds DO matter to you, opt for Maxis Home Fibre 30Mbps plan, priced at RM262.88 for non MaxisONE users and RM242.88 for MaxisONE 128, 158 and 188 users (including GST). It may sound like a lot, but unlike UniFi, Maxis offers the same download and upload speeds of 30Mbps. It’s especially useful if you frequently upload a lot of files for work, video, photo and file sharing. 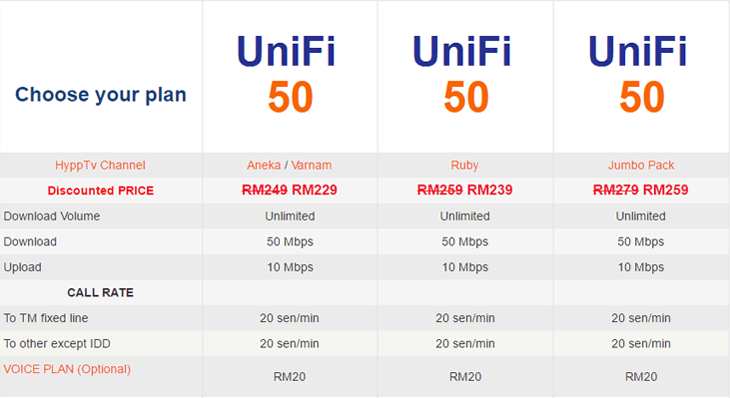 Of course, you can also choose UniFi Advance 50Mbps plans, which are almost identical to its lower speed plans other than the fact that they offer a download speed of 50Mbps and an upload speed of 10Mbps. 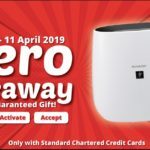 The plans starts at RM242.74 with Aneka or Varnam HyppTV pack, with the Ruby and Jumbo HyppTV packs priced at RM253.34 and RM274.54 respectively (including GST). If money is not an issue and you’re looking to get the fastest Internet speed there is, consider choosing Maxis Home Fibre 100Mbps at RM421.88 (RM353.88 for MaxisONE 128, 158 and 188 users) or TIME Fibre Home 100Mbps at RM157.94 (including GST). Both plans have the same download/upload speed, although the latter is only available in selected areas. Overall, the plans offered by UniFi aren’t bad at all, considering the download speed offered, wide coverage area, free equipment and the HyppTV thrown in. That being said, you might think differently if you’re a heavy Internet user who needs a higher upload speed, or simply not in need of the HyppTV pack. UniFi should consider introducing more plans to suit these demands, especially when more and more telecommunication companies are jumping into the same business wagon. **Update: On 31st March 2016, UniFi has joined in the ultra-fast broadband club and introduced 2 new plans that offer 100Mbps download speed and 50Mbps upload speed. The plans are divided to two categories: UniFi Pro plan for the personal users and UniFi Biz Pro plan for the commercial users. The UniFi Pro plan comes with 2 options, the first is priced at RM329 (RM348.74 with GST) and comes with any one of the HyppTV packs – which are Aneka, Varnam and Ruby Pack. New subscribers that sign up before 30th June 2016 will enjoy an introductory price of RM299 (RM316.94 with GST). The second option comes with HyppTV Jumbo Pack and is priced at RM359 (RM380.54). Both options in the UniFi Pro are offered with the same freebies as the UniFi Advance 30Mbps and 50 Mbps plan, with an addition of free Voice Plan. It basically means you get free 600 minutes voice calls every month, and if you exhaust the free minutes, your calls to fixed lines will still be free, although calls to mobile numbers will be charged at RM0.10/minute. UniFi has also upped it’s freebies game by providing free unlimited access to iflix from now until Dec 31, 2017 and complimentary 3 month free access to Viu – a HyppTV channel that specialise in Korean soap opera for both options under the UniFi Pro plan. With UniFi Biz Pro plan, you will get up to RM70 worth of free calls for both local and nationwide calls that lasts for 2 years. The freebies offered for this plan are also similar with the UniFi Advance 30Mbps and 50Mbps plans, with additional benefits of a Dynamic IP and restoration time of up to 12 working hours. Click here for more details on both plans. When it comes to plans comparison, the UniFi Pro plan is better than Maxis Home Fibre 100Mbps in terms of price during its promotional period, coupled with the fact that it comes with HyppTV and free unlimited iflix subscription until 31st December 2017. It would be the ideal option for Internet users with a large family and prefer a higher download speed than upload speed. However, let’s not forget that Maxis also offer its 100Mbps plan at a discounted rate of RM353.88 for MaxisONE 128, 158 and 188 users, which closes the price gap to RM36.94 from the initial gap of RM104.94. Either way, there’s no mistaking that Maxis is now the most expensive broadband provider when it comes to 100Mbps package, and the symmetrical 100Mbps download/upload speed is hardly worth the sum of extra money that you’ll need to fork out every month. On the contrary, TIME Fibre Home 100Mbps wins big as far as price difference goes, with it being cheaper by RM159 (inclusive of GST) even with UniFi Pro plan’s discounted price. TIME also offers 300Mbps and 500Mbps plans, at RM200.34 (GST included) and RM316.94 (GST included). Here’s why its a big loss for UniFi (with all its glory of being the largest broadband provider in Malaysia aside); ALL of TIME’s broadband plans have symmetrical download/upload speed! Sure, UniFi Pro plan gets you a lot of freebies including free Voice Plan and unlimited iflix subscription, but being able to download a HD movie in under 32 seconds would render the free iflix completely useless. As for the free Voice Plan, let’s be honest, how often do you really use your landline? You can either substitute is with Skype (there’s little possibility of buffering with the insanely fast 500Mbps Internet speed) or opt for pay-per-use plan with TIME. If you DO use your landline a lot for whatever reason, you can pay an additional RM10/month for 2,000 minutes. Still a lot cheaper than what UniFi Voice Plan offers. Of course, TIME Fibre Home 100Mbps is cheaper for a reason, as it doesn’t come with fancy freebies or TV channels. There’s also the downside of TIME being available in very limited places in Kuala Lumpur. But if your area is covered by TIME, you know which broadband provider you should be signing up for by now. Are you looking for the best broadband deal for you? Try our FREE broadband comparison tool today and get the best value out of your hard-earned cash. 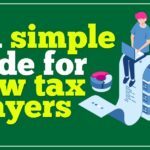 Find more money-saving tips and financial articles here!